An adorable nursery art print with watercolour bunny rabbits and the name of your choice. The perfect choice to add to a new baby's nursery. 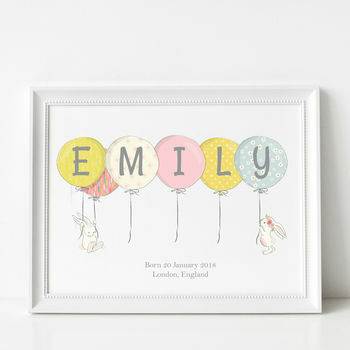 This stylish nursery art print is personalised with the name of the new baby. It features two sweet watercolour bunny rabbits holding balloons. Please note that our prints currently come unframed, allowing our customers to find or commission their perfect frame. Our prints are a standard size so will fit frames available in high street stores. 310gsm fine art paper and professional quality ink.